Wetlands are special areas of land that benefit both people and wildlife. Conservation Agent Paul Wightman will speak to our audience and take the mystery out of dealing with and living near a wetland. He will provide an overview of the Dennis Wetland By-Law and point out those activities near wetlands that require Conservation Commission approval. Issues addressed will include permit application requirements, tree removal, and landscaping within wetland buffer areas. 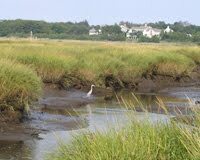 As a community, the more we know the better position we’ll be in to preserve and protect our valuable wetlands.